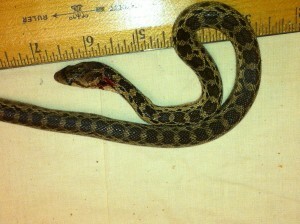 HONOLULU — A live snake was discovered and captured yesterday afternoon at a Keaau store on Hawaii Island. Workers offloading a 40-foot shipping container saw the two-foot-long brown snake and prevented its escape by hitting it. The snake, which has been identified as a non-venomous gopher snake, has since died and was shipped to Honolulu this morning. The shipping container arrived from California. Snakes are illegal in Hawaii. Snakes have no natural predators in Hawaii and pose a serious threat to Hawaii’s environment. Many species prey on birds and their eggs, increasing the threat to endangered native birds. Large snakes can also be a danger to the public and small pets.